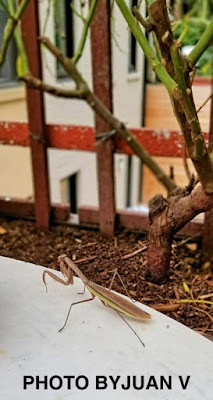 The Last Leaf Gardener: A Lone Praying Mantis Visits My Garden! 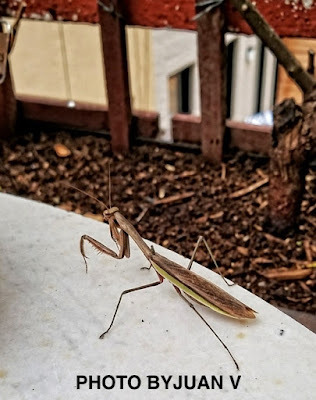 A Lone Praying Mantis Visits My Garden! The praying mantis seen in the images atop this blog entry, where he/she is moving gracefully — but with a sense of purpose — across the table that's in my rooftop garden, were taken by Juan V when he came to my place yesterday. The photo directly below features another image that Juan took when this insect alighted upon a branch belonging to my Continus Coggygria (Smoke Bush). 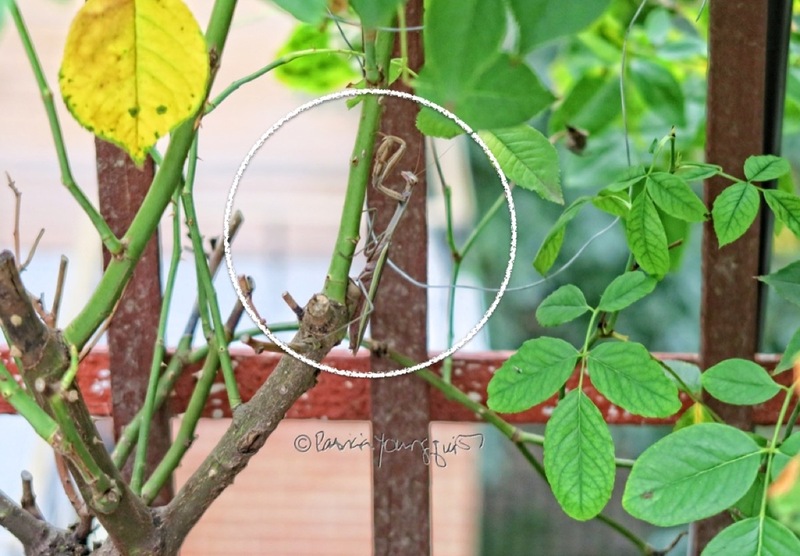 I have added a circle to his picture to help you see the creature as he/she is hard to spot on foliage. After all, as a page for Audubon states re the praying mantis, "Mantids also have the uncanny ability to blend into their surroundings, and with their knack for staying very still, it's very hard for birds and insects to identify them." 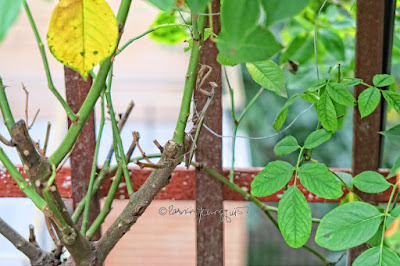 I also took images of him/her. My images show the praying mantis alighting upon my urban hedge of climbing white roses and can be found directly below. Each one of them has a circle added to it in order to help you see the creature. The encounter with this insect perked my curiosity and I did some research. One of the pieces of information I discovered truly touched me. 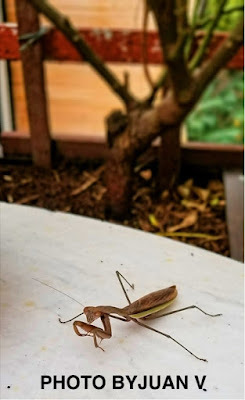 It was in a general Google search which stated, "If you know anything about the praying mantis, it will come as no shock that this insect is the paramount spiritual symbol of stillness and patience. 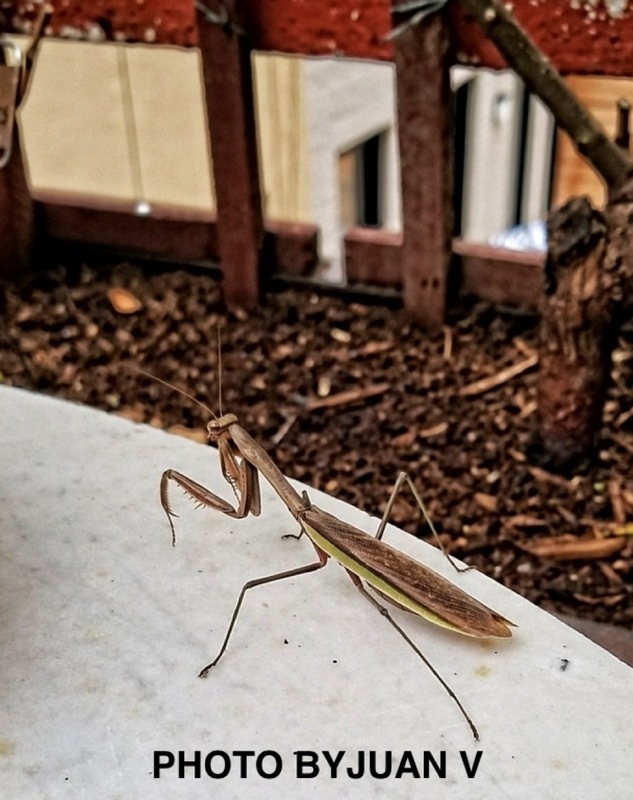 The praying mantis takes its time in all that it does. It takes care to pay diligent attention to its surroundings, and moving through life at its own pace." I hope this creature's presence in my garden will be an inspiration for me to stay calm and focused to persevere during a frightening time that I am experiencing. 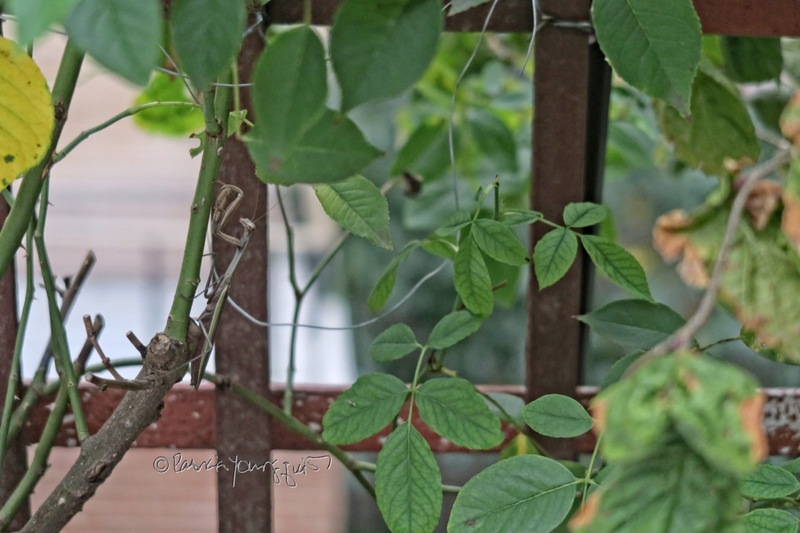 A Jack-O-Lantern does some bird watching.